This is why dudes should not be allowed to have computers. What's the worst prank your husband or significant other has ever played you? Whatever it was, prepare to be done one better. 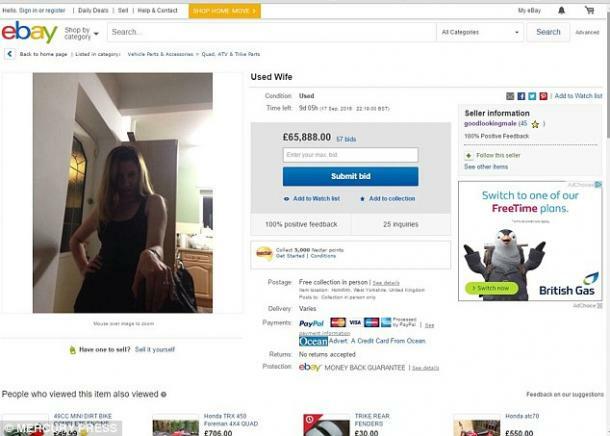 Simon O'Kane, annoyed that his wife Leandra wasn't being as sympathetic as he would've liked during a bout of the flu, decided it would be hilarious to try and sell his wife on eBay. 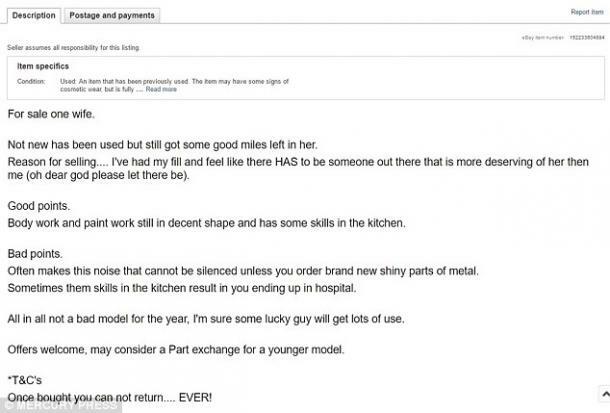 I have to say, his item description is pretty good, including an offer to exchange her to interested parties for a younger model. I'd like to note here that women get sick and we bust our asses to keep going. A man gets sick and becomes so desperate that if they don't get the attention they need, selling his wife seems like the next and most logical step. Remind me to try selling my boyfriend the next time he forgets its his night to cook dinner. Maybe the best part of this prank (or the worst?) is that Leandra had NO IDEA that she was being sold off on the web to the highest bidder! She only found out about Simon's antics when she got to work and a co-worker showed her the link. Apparently everyone in the office had already seen it, and Leandra was officially the last to know. Obviously eBay eventually removed the posting because of how it is TOTALLY ILLEGAL to buy and sell people on the internet. But before that happened, Simon admitted to receiving a few "interesting" offers from buyers whose interest were piqued. Some dudes just wanted to see nudes of Leandra (because of course they did), and another offered to trade her for (wait for it) A CAMEL. If I were Leandra, I don't think I might never bounce back from the indignity of having my worth equated to that of desert livestock. Yeesh. That said, the offers for Leandra were higher than the cost of most luxury cars. That'll do an ego good. If I ever found out my dude had tried to sell me on the internet "as a joke" I would probably retaliate by removing all of his belongings from my house and never sleeping with him again "as a joke". Because, while it's very funny to read about this happening to someone else, but I'm SO not a cool customer like Leandra, who seemed to take it all in stride. I kind of adore that the only thing about this that made Leandra really mad was that Simon used a crappy photo of her for the post. So make of that what you will, gentlemen, and I'd suggest before putting your wife up for auction at least consulting her about which photograph to use. She will thank you later.